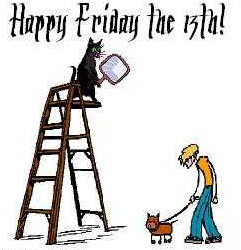 Well, here we are again, FRIDAY the 13th! This comes by way of Kerri Sparling, a fabulous T1 blogger on ASweetLife.org. Scene: A woman opens her eyes slowly, nudged from sleep by the sound of something screaming in the night. “What’s that noise?” she says, peering into the darkness. And then, out of nowhere, comes the wail of the Dexcom’s BEEP BEEP BEEEEEEEEP! And there’s nothing in the house to treat that low except for cucumber slices. … I’ll admit that my versions of horror movies are a little more diabetes than haunted house, but with tomorrow being Friday the 13th, it’s a perfect time to look at some superstitions through a diabetes lens. There are plenty of superstitions that I subscribe to, and despite how ridiculous they are, they remain part of my mental repertoire. But on the diabetes front, I try to keep my good luck/bad luck ideology out of rotation.